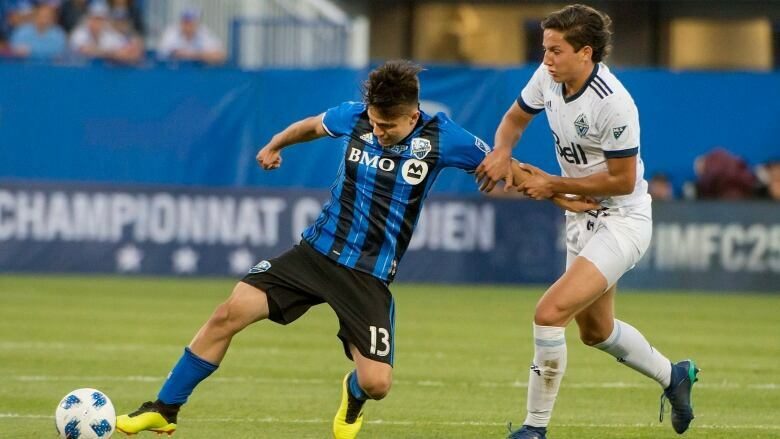 Alejandro Silva scored in the 58th minute as the Montreal Impact downed the Vancouver Whitecaps 1-0 in the opening leg of their Canadian Championship semifinal on Wednesday night. The Impact and the Whitecaps were neither ecstatic nor overly disappointed after Montreal's 1-0 victory over Vancouver to open their Canadian Championship semifinal on Wednesday night. The Impact were relieved to get the victory but felt they should have had at least one more goal, while the Whitecaps were hardly devastated at being down only a goal going into the second leg of the two-game, total goals series in Vancouver next Wednesday. "Of course we would have preferred to score the second one to have a bigger advantage before going there because we've played there and we know it can be a tough place," Impact coach Remi Garde said. "We have to manage the game we have to play in Portland [on Saturday] as well. "It's half time [in the series]. We didn't concede any goals. If we have the chance to score one over there it will be important for us." Alejandro Silva got the game's only goal in the 58th minute. The Impact had most of the possession and several excellent chances but couldn't get a ball past Stefan Marinovic until some intricate build-up around the Vancouver penalty area saw Jeisson Vargas feed Saphir Taider on the right side for a pass back to the unmarked Silva for the goal. "We were a bit lazy at one point and it cost us the goal but we can be better for the next game," said Whitecaps midfielder Aly Ghazal. The Impact, who have won seven of their last nine games, used more of their regular starters than the visitors, which is normal in Voyageurs Cup play. But they even left scoring star Ignacio Piatti on the bench until the 71st minute and gave Clement Diop his first action of the season in goal. Vancouver left out top talent like Kei Kamara and Alphonso Davies, while defender Kendall Waston rested a sore groin. They will likely field a stronger starting 11 in the return leg. "We could have put 11 kids out there today but we want to take this tournament seriously and we want to try and win it," said Whitecaps coach Carl Robinson, whose team lost 5-4 on aggregate to Montreal in last year's semifinal. "It's not easy to pick your team, so you have to do it on feel and freshness. "I'm glad I put 11 fresh bodies in there today because after 60 it was firmly in the balance. They had 10 minutes where they were firmly on top and I could feel the game getting away from us so I made some adjustments and we saw the game out quite comfortably in the end." Russell Teibert of Niagara Falls, Ont., who won a Voyageurs Cup with Vancouver in 2015 and wore the captain's armband against Montreal, called the one-goal defeat "not such a bad result." Samuel Piette of Repentigny, Que. the acting captain for Montreal, had a similar sentiment. "The main thing is we didn't give up a goal," said Piette. "We scored but we didn't concede. "Now if we can get a goal there it will be tough for them to come back." The first half saw each team hit a goalpost, with Anthony Jackson-Hamel heading onto the woodwork in the 24th minute and Cristain Techera grazing a post with what looked more like a pass attempt from a tight angle in the 33rd. Jackson-Hamel had another glittering chance in the 23rd when he was sent in on the right side but shot well over the bar, and then shot off a crossbar in the second half. Vancouver's best chance came in the 50th minute when Rudy Camacho was called for a hand ball just outside the 18-yard box, but Nicolas Mezquida shot wide from 20 yards out. The winner advances to the final against either Toronto FC or the Ottawa Fury. Toronto won the opener of its semifinal 1-0 away. The Cup winner qualifies for the CONCACAF Champions League. The Impact are looking for their first Canadian Championship since 2014, from which they went to the Champions League final. Montreal right back Michael Petrasso was replaced by Jukka Raitala in the 38th minute after taking a knock on the head. Teibert made his record 20th career Canadian Championship appearance. The Whitecaps play a league match in Seattle while the Impact are in Portland on Saturday.